Rural Development is diverse and needs to be approached from many directions. In the session on the art project “Resilience – Touching a Colourful Sky” the social and emotional dimension is addressed by helping people to reflect on and express their feelings in different ways. There was not much debating involved in the session on resilience performed by the students of the program Rural Development and Communication from Van Hall Larenstein University of Applied Sciences. Rather taking part meant: “Grab a brush, choose your colours and paint what comes to your mind!” With content smiles on their faces, students and professors alike got down to the artistic business. 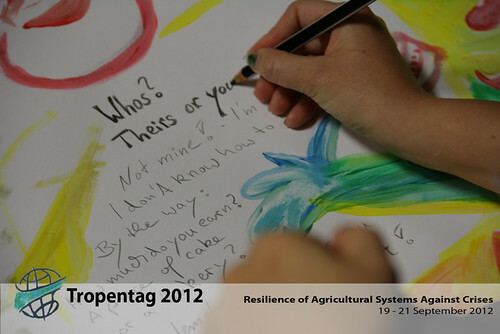 Within only one hour the participants each produced a painting and a poem dealing with the topics that concerned them the most during the last few days. 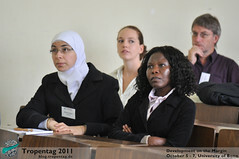 Various subjects came to the minds of the participants from different disciplines and nations. A short film depicting impacts of the Orissa Floods on land and livelihoods by Dr. Joe Hill (Tropentag October 6, 2011). The Cyclone warnings on the radio were only sent out hours before it hit. The people of Orissa suffered significant losses and after the storm resided, their only resort was to salvage rice and coconut water. Relief aid only came 4-5 days later. This can almost be seen as an regular scenario in Orissa. Farmers have no land of their own, and if they do it's not fertile to grow enough. Farmers are also aware of their fertilizer use degrading their land fertility, but they have no choice despite the fact that it could cause the next floods to be even worse. Many farmers have resorted to fishing in order to survive but this too is not enough. While cyclones and floods wipe out any coastal aquatic life, industrial fishing in deep waters outside Orissa significantly reduce fish numbers coming into the coast, significantly reducing local fishermen's catch. On land, there is a lack of water and a lack of work. "Every day is a struggle to make ends meet." 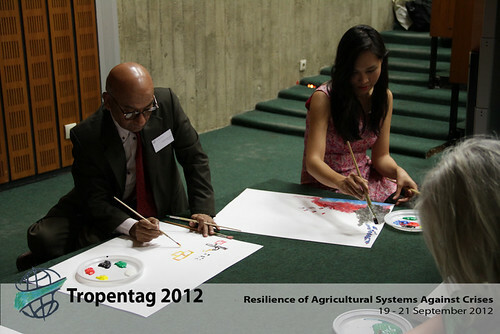 The thematic session on Crop Biotic Stresses on Friday 7 October, 2011 touched upon various research into crop production and crop management methods. While the results were also unique, the discussions at Tropentag focused their interest on the improvement of methodologies. The impacts of crop management. The session looked at the effects of Chlorpyrifos in Costa Rica and how they are having a negative impact on the children in the area. The exposure came from the use of Chlorpyrifos-bags used in banana and plantain Plantations. We were also introduced to the research through a microarray analysis of gene expression induced in tomato leaves. The genes were compared between treated/untreated/diseased/healthy tomato plants and observed for activation of plant resistance. Interestingly enough, someone in the crowd commented on the research and arrived at opposite results having done the same research. The debate was left up in the air… to be continued during the following coffee break. Fellow presenters listening to their colleague's presentation. Africa stricken with Striga! The Tropentag 2011 Thematic Presentations on Animal Production Systems discuss various trade-offs between different animal feeds and feeding practices. The livestock in question ranged from cattle to shrimp and even guinea pigs! 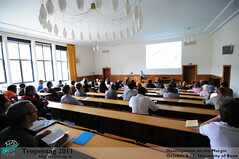 Presentations on Animal Production Systems at Tropentag 2011. Transforming to Integrated Ecosystems The common thread through all the presentations was how to integrate livestock production into the natural environment. Sustainable aquaculture that aims at minimizing impact on the environment can in the long run provide farmers with much better livelihoods. We were presented with some great use of Google map imaging depicting the boundaries of land usage and how livestock production can be integrated without degrading the environments around it. A ratio between environmental land coverage and live stock land usage enforces the ongoing theme of 'doing more with less'. Bernhard Brümmer of Georg-August-Universität Göttingen opened the second-set of parallel oral presentations with a focus on market development. There were 4 oral presentations instead of the planned 6 covering rural market development-related topics within developing countries. Berhanu Gebremedhin: Crop-Livestock Interactions in Smallholders´ Market Participation in Ethiopia In this paper, he specifies that interdependence exists on both households´ net market positions (e.g. Net Buyer or Net Seller) for crops and livestock. He also showed that, crop purchases are financed by livestock (vice-versa) and excess income emanating from crop sale is converted into livestock asset. Additionally, he said that policies and strategies should pay attention to the simultaneous production and marketing of both crop and livestock commodities. Christina Handschuch: Adoption of food safety and quality standards among Chilean raspberry producers – Do smallholder benefit? 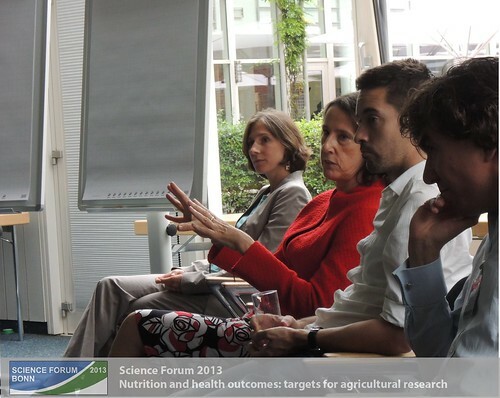 Meike Wollni substitutes, and discuss their findings that small-scale farmers has a low likelihood of opting for certification whilst certified farmers would obtain better product quality having a positive relationship to their net household incomes. Also, it was suggested to extend support to small-scale farmers in implementation process, collective sharing of compliance costs, and access to information. Mildred Garcia: Third party socio-environmental certifications: A new perspective for small-scale coffee producers in Honduras?